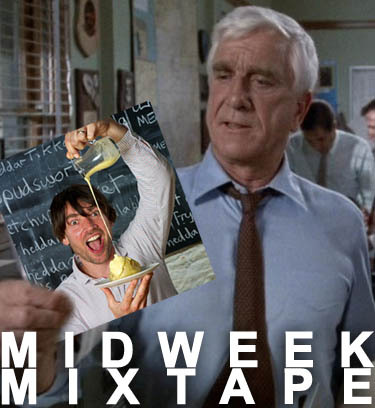 MIDWEEK MIXTAPE // Bestival 2011 Special! Today, ANBAD is thrilled to announce that it has become the official Alex James’ Easy-To-Use-Cheese-Product Fan Club discussion forum. The ANBAD team has long been a huge fans of Alex James’ pioneering work in the field of making generic mass-produced cheese into shapes and selling it to kids whilst pulling ‘wacky’ faces. FIRST: Daughter makes agonisingly direct, pure and dreamy songs. Sometimes it’s better not to beat around the bush. Coupling a lovely voice with good songs is a simple idea that is a weirdly under-implemented one. Thus Daughter (or Elena to her, er, mother) is a delightful rarity. SECOND: Riotjazz are proof that throwing everything into the pot does sometimes reap rewards, as opposed to producing a grey mush. The rewards here are multifarious, as you’d expect of a song swirled with jazz, drum ‘n’ bass, hip-hop and soul. THIRD: Fly Frankie Fly are indeed, as Bestival organiser Rob da Bank pointed out, ‘kind of indescribable’. This is possibly because commercial R&B, chiptuning bleeps, clunky rapping and boyband choruses have not, to my knowledge, been combined quite like this before. Unique. FOURTH: Maverick Sabre was described by Q Magazine as “one of the most exciting acts on earth“. This sadly puts him behind a near-infinite number of other artists who are exciting beings on other planets, but whatever. He’s also been nominated for a MOBO, but don’t hold it against him, because he’s got quite a nice voice – and this might get overlooked. Posted on September 7, 2011 by Joe Sparrow. This entry was posted in Headline, Today's New Band. Bookmark the permalink.